In December 2017, Congress passed the GOP’s latest tax bill. The Republican Party faced major deliberation in creating a bill that would successfully pass through both Senate and Congress. If you’re anything like the average American, the jargon of governmental tax procedure creates more internal chaos than clarity. However, underneath the sensational headlines, the drama between House majority leaders, and the financial terms only Merriam-Webster really knows, are policies that will eventually affect our day-to-days as both tax-paying citizens and students in a higher education institution. The good news? Students at the University of Baltimore, both undergraduate and graduate, will retain most of the tax benefits that we already have. Among student tax policies are student loan interest deductions, in which we receive an income tax deduction for any interest paid in public or private higher education student loans. Essentially, any monthly interest paid to our student loan provider is deducted from our income tax. This policy will stay in effect. Another topic of heated debate, and recent nationwide student protest, were graduate student tuition waivers. Republicans were initially planning on nixing this benefit, meaning that graduate students receiving tuition waivers from universities, whether merit-based, fellowships, or military benefits, would actually have to pay taxes on that tuition. The “waived” tuition would be taxed as if it were personal income. This would have created major financial despair for graduate students receiving tuition waivers. According to NPR, “about 145,000 grad students received a tuition reduction in 2011-12.” The taxation on those waivers would have created major financial trouble for the graduate students involved. 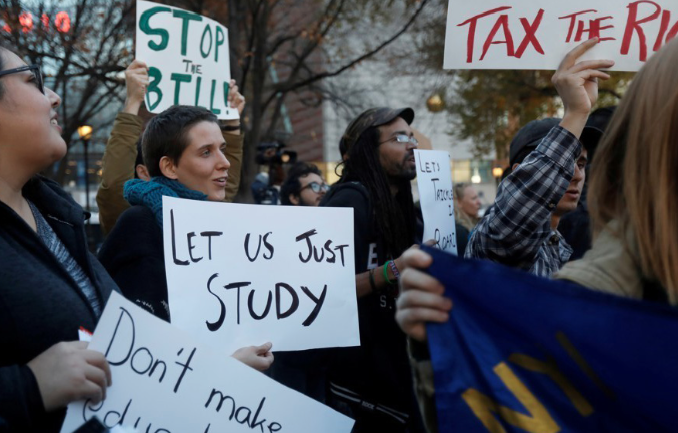 For now, though, students in higher education trudge on without taking any hits from the tax plan. Our next challenge will be the reauthorization of the Higher Education Act, set to take place this year. This one will be worth watching, and perhaps joining the fight, too. On the line are student loan forgiveness programs which many government and non-profit employees depend on. We’ll have to stay tuned.